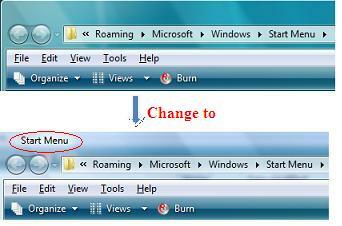 Whenever you open windows explorer in Windows XP, the folder name will be displayed in the window title bar. However, you probably may notice that this feature is no longer exist in Windows Vista due to certain reason. If you would like this feature to be inherited to Windows Vista, you can actually do it by following below simple steps. To display folder name in explorer title bar, it can be done by running a utility called AeroBar, which is a light application that consumes little CPU cycles. 1. Download and save AeroBar to any folder in local drive. 2. Double click to execute this utility. 3. Open windows explorer, the folder name where you are in is displayed in the title bar. 4. If you want this utility to be up and running whenever windows is startup, then just copy AeroBar.exe to your StartUp folder. To stop the utility, just go to task manager and look for AeroBar.exe under Processes tab, then click End Process button to kill it.